Goals from Kerala’s Balkan forwards, including a blockbuster Slavisa Stojanovic strike saw David James down Steve Coppell. It was an interesting night. The excitement was in the air and the fans could smell the start of a revolution. And what better match to kick the new season off. 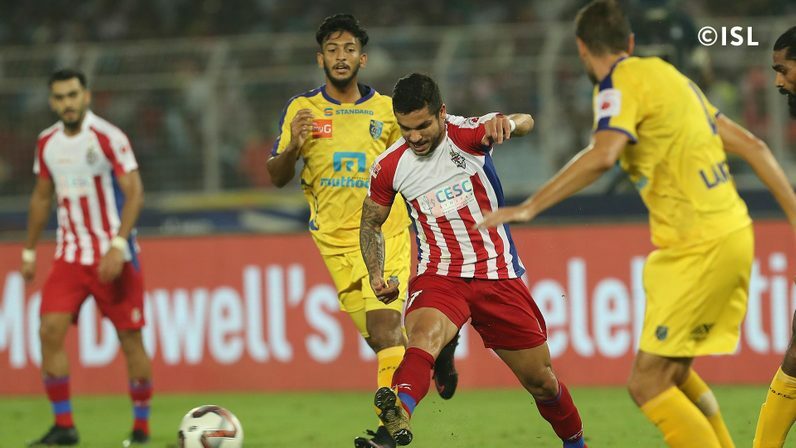 ATK named a very very different side from the previous ISL season, with Jayesh Rane being the only player retaining his position in the starting XI from last season. Pronay Halder and El Maimouni started in the middle of the park, while Balwant Singh, Manuel Lanzarote and Everton Santos making for an exciting and attractive starting lineup. The 4-2-3-1 that Steve Coppell chose to go with John Johnson and Gerson in the heart of defense and Arindam Bhattacharya guarding in between the sticks. Meanwhile, David James’s Kerala Blasters played with a 4-4-2, with Dheeraj Singh, at 17 years old, making is ISL debut. With Anas suspended, Sandesh Jhingan started in the heart of defense with Lakic-Pesic, while Nazary and Doungel played in midfield. The two muscular Balkan forwards Poplatinak and Stojanovic lead the forward line for the Blasters. Kerala started on the front foot, seeing a lot of the ball and creating the more meaningful chances. Sena Ralte had to make a goal-line clearance to keep the score level in the early exchanges. Lanzarote then hit the crossbar with a beautiful effort while Everton Santos saw his effort just whistle past the goal.. With no breakthrough coming going into the break, it looked like the new season of ISL would start off with a goal-less draw for the second time running. The second half saw ATK starting to show their home authority, putting Dheeraj’s goal under pressure. But the positive moments were short lived, with Kerala Blasters once again grabbing the game by the scruff and taking it to ATK. To get the control back, Coppell brought on surprise non-starter Kalu Uche and Eugeneson Lyngdoh. The move though, backfired, with Poplatinak breaking the deadlock soon after. Stojanovic tried his luck from outside the box, but his shot took a deflection and looped up in the air. 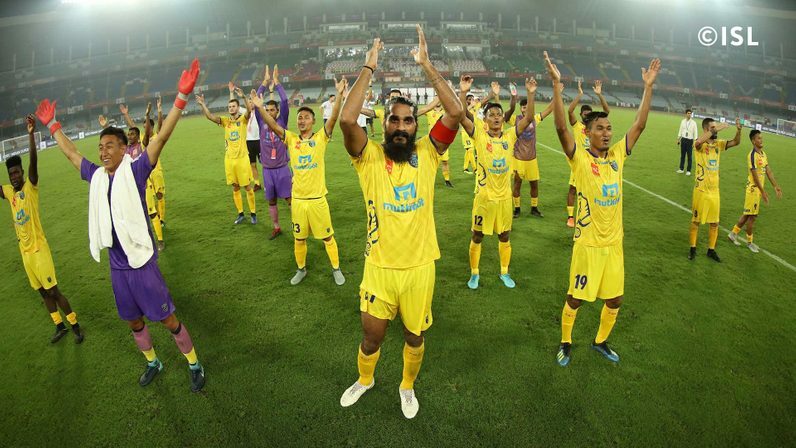 Poplatinak showed a great desire to win the ball and reached it before Arindam could rush out of his goal to guide it past him to score the first goal fo ISL 2018 and put Kerala Blasters in front. In the 86th minute, Narzary found Stojanovic with a simple pass who exploded a shot into the top right corner from the edge of the box. It was a picture perfect goal, the one’s you see regularly in FIFA game. With that goal, the chances of ATK something from the game were killed as Kerala Blasters got off to a positive start. “The main takeaway was that we gave away the ball cheaply. At half-time, I was quite happy. We had more possession. We then gave the ball away on so many occasions. You need to keep possession. Once they scored the goal I got the feeling we won't be able to come back. We took long shots but didn't impact the game. “I was slightly frustrated in first half. I didn't like the style of play. The second half was much better. The wing backs were disciplined. I thought we were the better team. Tough first half overall but we came back in a great manner. Vineeth didn't change the game but the team overall did. In the second half, the changes we made paid off after we got back on track. Vineeth is of course a good player. He had a positive contribution of course. Happy to beat a team like ATK.